Form-A-Feed works with you to develop a flexible nutrition program that supports the entire herd. We carry a diverse product line of milk replacers and calf starters, heifer feeds, lactation cow premixes and dry cow and transition feeds. We have the flexibility to make anything from a small premix to a complete feed. We work with your feedstuffs to help design a package that is right for you. Prime Life Heifer Premixes supply appropriate amounts of calcium and phosphorus in diets for beef or dairy heifers. This product contains excellent levels of Vitamins A, D and E, and trace minerals. Prime Life Heifer Premixes come with several medication options. Prime Life Heifer Pellet R is a 36% pellet protein concentrate with highly bioavailable trace minerals and Vitamins A, D & E. This product is medicated with Rumensin® for increased rate of gain in heifers over 400 pounds. Prime Life Vitality Add-Pack is used in transition dairy cow diets to supply encapsulated B-vitamins, chromium, methionine, choline, and other components for optimal liver health. This unique blend addresses the stress of calving and the metabolic disorders associated with fat metabolism. Prime Life Dry Cow Base is a protein, vitamin and mineral supplement for non-lactating dairy cattle. It supplies protein, vitamins and minerals necessary to meet the nutritional needs of the animal during gestation. Vitamins and trace minerals during the dry period promote proper nutrient balance for metabolic processes. This dairy premix provides the optimal level of vitamins A, D, and E in addition to macro and trace minerals. It can be mixed with a total mixed ration (TMR) or grain mix to provide the right nutrient balance for dry cow diets. FAF Robo Pellet is a specially designed pellet proven to work through a variety of robotic milking systems. Form-A-Feed offers a wide range of lactation premixes for every situation. Buffer packs available. Sci-Mic 40-20 is a direct-fed microbial formulated to help support rumen health, increase feed intake, and improve digestibility of forages. It contains a special blend of live cell yeast, lactic acid producing bacteria, and digestive enzymes which help stimulate that growth of the natural bacteria and helps maintain a normal intestinal microbial population. Form-A-Lac HL Plus is a pelleted supplement that helps get dairy cows through the early nutritional stressors with the start of lactation. This product helps stimulate intake and improve energy utilization. It contains niacin that helps with metabolic disorders of calving. Sci-Lyte is a soluble meal product for young calves that need supplemental fluids, electrolytes and energy during a scour event. This combination of ingredients helps maintain body fluids, supplies the intestinal environment with beneficial bacteria, and provides nutrients that improve absorption of water and electrolytes. Sci-Mic CB is a bolus capsule for young calves. It contains lactic acid producing bacteria and live cell yeast to support feed intake, intestinal health, and calf performance. Calf Formula D is a direct-fed microbial for calves. This product contains high levels of lactic acid producing bacteria and live cell yeast to help support digestion and feed efficiency which results in faster gains. This product is dispersible in either water or milk. Dairy S.C.O.P.E. is a direct-fed microbial designed to improve rumen and intestinal health. This formulation supplies the rumen with lactic acid producing bacteria and digestive enzymes. Dairy S.C.O.P.E. improves dietary nutrient availability, improves milk yield and milk components, reduces digestive upsets, stimulates the immune system, and stabilizes feed intakes. Dairy S.C.O.P.E. is packaged in a heat-sealed bag to maintain stability and viability of microorganisms. Heifer Framer R is a pelleted supplement designed for growing dairy heifers. It supplements protein to support growth and frame of heifers entering the show ring. It provides chelated minerals in addition to minerals and vitamins that optimize growth and performance of replacement dairy heifers. Contains Rumensin® to improve feed utilization. Prime Life 38% Intensity Calf Pellet Concentrate with Stealth 5® is designed to maximize genetic calf growth. This product provides natural protein sources, highly bioavailable trace minerals, yeast extract, yeast culture, B-vitamins, salt, and Vitamins A, D & E. This pelleted product is to be blended with grains to make calf starter or grower complete feeds. Stealth 5 is added to interfere with pathogens binding to host tissue. Early Wean Calf Starter VP with Stealth 5® is designed to maximize genetic calf growth and promote early weaning. This product provides natural protein sources, essential oils, highly bioavailable trace minerals, yeast extract, yeast culture, B-vitamins, salt, and Vitamins A, D & E. This pelleted product is fed as a complete feed as a supplement to milk replacer. Form-A-Feed offers a variety of texturized calf starters. Our floor-stocked texturized products include Prime Life™ 20% Calf DX or Prime Life 20% Calf Bov. Prime Life 20% Calf Texturized Feed with Stealth 5 is designed to be fed to calves from birth to weaning for a healthy start. Medicated with Deccox® or Bovatec® for the prevention of coccidiosis. Intakes are improved after calving from what we were doing in our previous program. 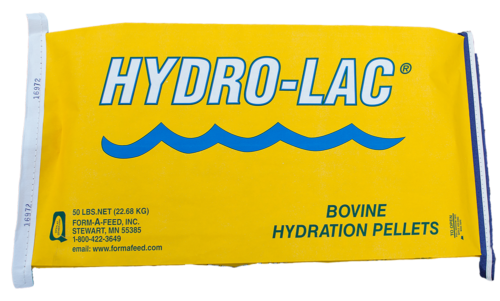 Fresh pen milk is up and Hydro-Lac is the only thing we are doing that is different. I am a firm believer in Stealth 5 and so are my customers. We have been using ShowDay Feeds for many years and have always been impressed with how our cattle have performed. The product is consistent and high quality every time you open a bag.